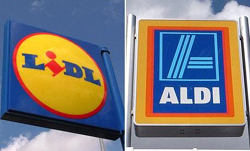 Aldi and Lidl are two separate German chain-stores that have many, many outlets now in Ireland. They both sell a wide selection of food and stuff at, sometimes, ridiculously low prices. Shoppers in Ireland, still feeling the results of recession, are flocking to these German discount stores in greater numbers than ever before. Last year Mick Mac Connell wrote and sings a really funny ballad about shopping in Lidl & Aldi. Watch him sing it on this video below. We have a brand new Aldi here, but I doubt I'll try it. I'm partial to our locally owned store. Aldi has made some inroads into the US, but so far they seem to confine their merchandise to food and household products, the same as what you'd find in an ordinary supermarkets. Most of them seem to be brands I've never heard of, and they're not that much cheaper than many American stores. Also, there's no continuity - the first time I went into an Aldi, I bought a bag of snacks that looked and tasted like tiny little croissants, but when I went back a couple of weeks later, they didn't have them, and the store manager told me that they "get whatever the warehouse sends them", which is "kind of random". I haven't bothered going to Aldi any more. I didn't know they were German based stores. There's an Aldi in my Chicago suburban town. I shop there almost every week. Their produce isn't always good (though some of it is fine). But it's a good store for staples: milk, eggs, flour. we have Aldi stores here in Australia too, what I do have to get from a supermarket, I tend to get from there. The songs amused me a great deal. Two national chains pulled out of the area and a small local grocery closed. This is in a 50 mile radius enclosing the one real city in the area. (ok close to a "real city" - real for us). Here in the Netherlands Aldi and Lidl are also at the cheap end of the price range. They've become more popular here too over the last few years, due, I suspect, mostly to the recession. People generally take some getting used to the store brands, but then find that a lot of stuff is as good or better as big name products. I used to shop there already as an impoverished student years ago, so am quite amused by this popularity. Hi. You added me and I just wondered if we know each other from somewhere and how you found me. :D Hope all is well. I saw a comment you made on another posting and thought you might be an interesting person to know. Let's hear it for Trader Joe's! Very funny, and I agree with the individual who characterized their stocking as "kind of random" here.